NVIDIA’s flagship next-gen graphics card the GeForce GTX 1080 has been the dominating topic in hardware circles for the past month. This new release has proved itself to be both thrilling and frustrating; thrilling, because the GTX 1080 is NVIDIA’s most powerful single-GPU to date but frustrating because of the widespread lack of stock availability. But there is hope; in the coming weeks this should eventually clear up and cards such as the one we’ll be analysing today will be easy to obtain. 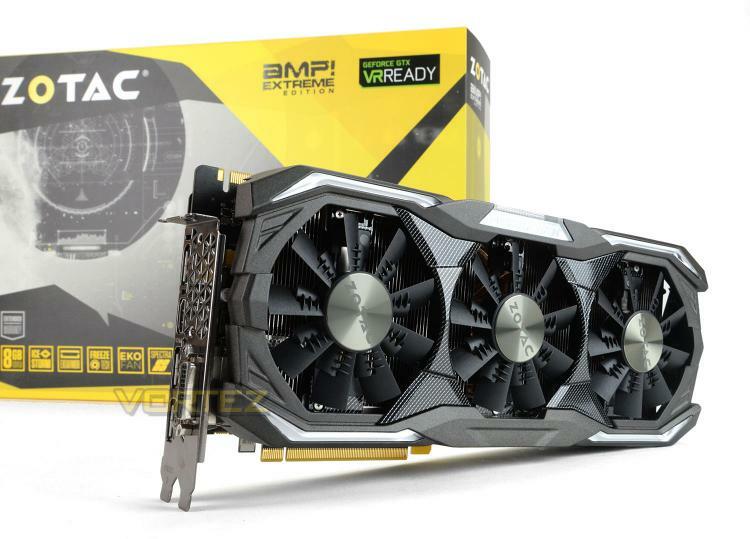 Under observation today is the ZOTAC GTX 1080 AMP Extreme. As tradition would have it, AMP editions arrive with a factory overclock but this graphics card goes further than that by offering a substantial overclock to the GPU and memory and boasting a superior cooling solution, compared to the standard AMP edition. Joining the RGB revolution, 1080 AMP Extreme also arrives with Spectre lighting which is adjustable through ZOTAC’s FireStorm software, presenting the user with the option to tweak the colour and animation effect. Do we have the fastest GTX 1080 in our hands today? Let’s find out!